Are you taking the Spanish Abiturprüfung exam this course or the next one? In Proyecto Español we have designed this course specifically to help you pass this exam. We help you to improve your Spanish so you will well prepared and confident to achieve your goal of an excellent mark and imroved language skills. Together we improve the 5 key competences of Spanish, as well as specific tasks and topics for the Abitur exam. We are experienced in exam preparation as we prepare our students of Spanish for the DELE (Diploma of Spanish as a Foreign Language). 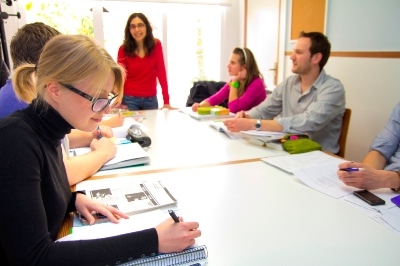 We also prepare students for official German exams of the Goethe-Institut since 2012 and teach in our school intensive Spanish language courses for young people who are having 'Ausbildung'. As we already offer courses for non-native teachers of Spanish and Spanish courses for workers in Germany considered as 'Bildungsurlaub', we are pleased to now offer a special course for students of Spanish who are in the Gymnasium. In these lessons the five Spanish Language skills in addition to practice the specific tasks of the review work for exam: 'Abiturfach Spanisch'. The course is divided into two parts. The first part contains five sessions (50 minutes) in a group of max. 10 participants where the students amplify their Spanish skills in terms of grammar, vocabulary, conversation and culture. The second part contains a daily lesson (50 minutes) where the students work on subjects and exercises of the Abiturprüfung Spanisch, which the teacher had chosen before. You can check for all the available accommodations here. You can start the course any Monday during all year round and you can book it from one week as many as you might need. Most of the students register for this course for an average of 2-4 weeks. Tell us your level and your objectives and we will make a personalized recommendation on the number of weeks that we believe would be optimal. This course has a price of 225 EUR/Week.